Hi again! 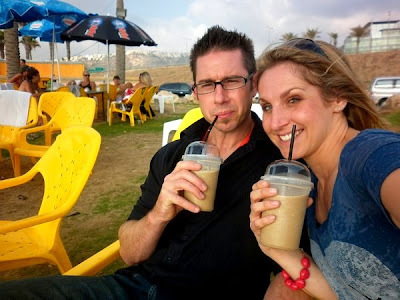 More highlights from our recent trip to Israel (see here for Part 1 & Part 2). After climbing Masada we went swimming in the Dead Sea - such a strange experience! 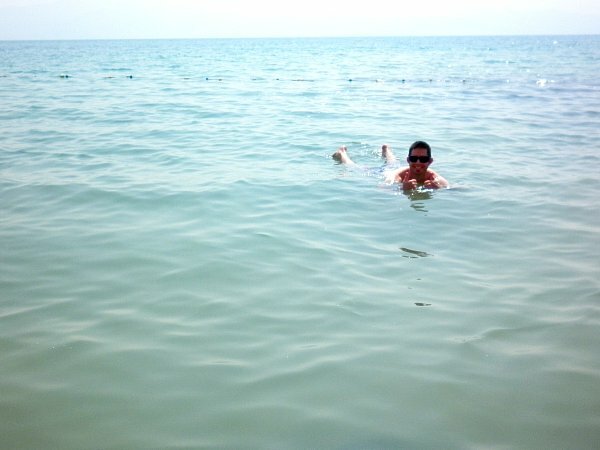 Normal salt water consists of around 3% salt - yet the water in the Dead Sea is 33% salt... so salty that you float. The mud is full of minerals and nutrients that is great for your skin. 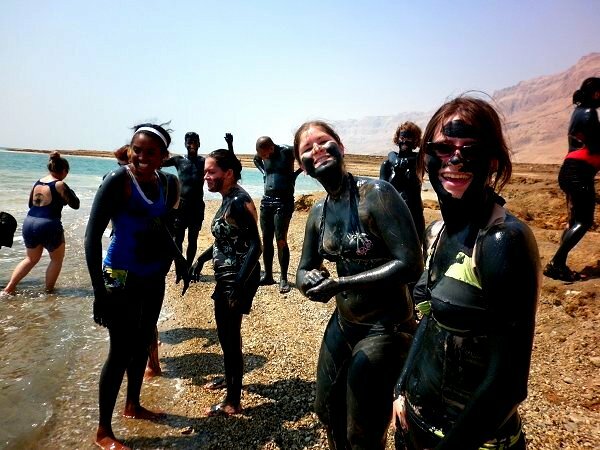 Some of our group covered in Dead Sea mud! As we drove through the area here there were so many amazing historical places! 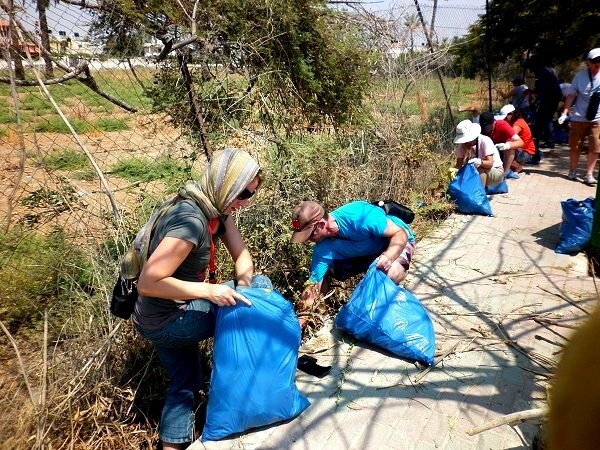 Probably one of my highlights of the trip was what we did next - we had an amazing opportunity to enter into Jericho (within the West Bank) and show our love to the Palestinian people living there by cleaning up some of their streets. Before we could enter Jericho our Jewish guides hopped off our bus, as it wasn't safe for them to enter this Palestinian governed city. We also had to make sure that no one was wearing anything with Hebrew writing on or symbols, as this could have the potential to stir up locals in the area who felt animosity towards Jews. To be honest - I felt slightly nervous at this point! The event was well planned and organised though, with the local police being aware of what we were going to do, and coming to cordon off the streets we were working on. It was hot and hard work, but so worth it! One of the local shop keepers was so excited at what we were doing that he started singing loudly and dancing in the street, clapping his hands with joy. Another local man just kept repeating "thank you, thank you". 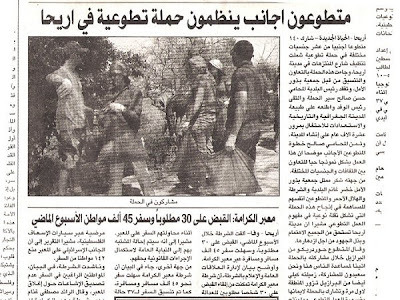 Having 150 Christian youth from all over the world coming to show their love in action caused such an impact that the local Mayor even came to thank us and an article was in the local newspaper (with Symon in the shot)! Our group in the local newspaper! After being in the desert regions we traveled on to Mt Carmel, Haifa. We learned so much in our time here. Some of the ministries in this area are doing amazing work with drug addicts, youth, and supporting Sudanese refugees who have been through horrific circumstances. 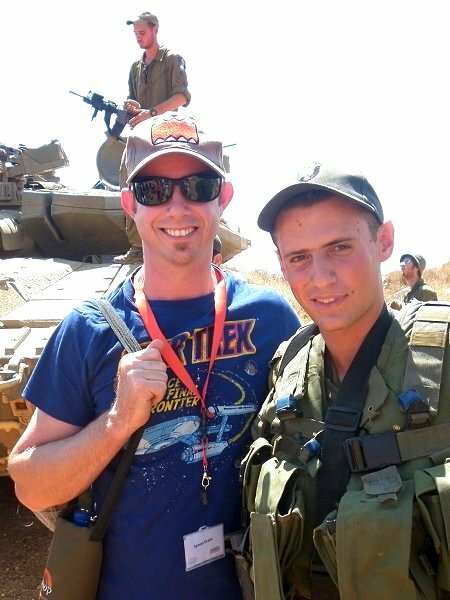 Another amazing experience was visiting an Israeli Army base (which of course meant hubby had to have multiple photos next to tanks and guys with guns) where we gave gifts to the young soldiers and got to know them. Certain things can't be posted online for security reasons - but it was such an eye opening experience! The very next day there was an Israeli/Lebanese altercation with several deaths around that very same area that we were. Often we would see "warning minefield" signs, while traveling around. In some places there were ruins of buildings with damage from rockets/bullets and old tanks - not something we ever see in New Zealand! Part way through our journey, while going on a beautiful hike in the Golan, a very sad thing happened... my camera (with nearly 600 photos on) fell into a river. Although the camera was beyond repair, thankfully my photos were still stored safely on the memory card. I was able to borrow another guy's camera for the remainder of our trip (thanks Paul!!). 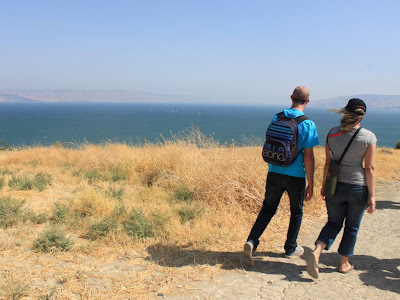 We visited many beautiful places - Caesarea Philippi area, Capernaum, overlooked the Syrian boarder and had a boat ride on the Sea of Galilee. Most days we were up early, and in bed late with our whole day filled with walking, teaching, amazing experiences and emotional moments... we slept very well each night. Thanks so much for sharing your experience. I know what it is like to come back from a mission trip. Sometimes you can be on a downer for a couple of weeks so I have been thinking of you and Symon. It can be quite overwhelming reentering and I think you have done an awesome job sharing so soon after you have gotten back. wow....I can't wait for more!!! I am enjoying walk through this with you PJ...keep it coming! ps love the head wrap you are wearing while cleaning the streets! What an amazing trip! I had tears in my eyes as I was reading everything. Beautiful, beautiful. The places you have been are places we've read about and heard about all our lives and it must have been so special to have been there and seen for yourself. I've loved reading these posts Kris, amazing. Wow! The Sea of Galilee is huuuge! I never expected it to be that big.